The Big Wheel is a fun outdoor toy. The Hot Wheels Big Wheel is a favorite toy for many toddlers and very young children. The Big Wheel has seen many changes over the years, but its fundamental design has remained a familiar icon for childhood fun for many generations. Louis Marx Toys introduced the original Big Wheel in 1969. The toy was an instant success, and other versions were soon to follow. In 1972, another toy company called Carolina Enterprises released the Hot Cycle, a product similar to the original child's riding machine introduced by Louis Marx Toys. Louis Marx Toys and Carolina Enterprises merged during the later half of the 1970s to create Empire Industries. By then, the Big Wheel was a staple for a child's collection of toys. The company closed its doors in 2001, but the toy has been revitalized and redesigned by Empire Toys, a facet of Alpha International, Incorporated. Among the most appealing aspects of the toy is its outstanding safety reputation, making it one of the top selling toys of all time. The Big Wheel sits low, with a relatively wide girth. The design is stable, with incidence of toppling over close to nil. 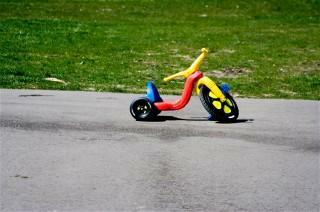 This child's ride-on toy is far safer than bicycles and tricycles, according to the Consumer Products Safety Commission. In spite of the ride-on toy's excellent reputation for safety, some precautions should be practiced when using this type of toy. Children using the wide wheelbase construction are less likely to topple over, but there are some risks, especially if a child is left unattended. Using precautions and setting rules for safe play can significantly reduce the risk of injury. The Hot Wheels Big Wheel is an offset of the original child's ride-on toy. A few different versions of the Hot Wheels style have been developed, each offering unique features and designs. Hot Wheels Xtreme Cycle is a riding toy that has been discontinued. The product features a power brake, an element that was first introduced in the 1970s. Few Big Wheels offer this feature. Suitable for ages four and older. Hot Wheels Extreme Cycle is another discontinued toy. This ride-on features smooth rear "slick tires" for big powerslides. Suitable for ages three to eight years. Hot Wheels Powerslide is a sleek version that has a relatively thin construction reminiscent of a traditional tricycle. The riding toy sits low and features the readily recognized large wheel in its front end. Suitable for ages four and older. Dynacraft Hot Wheels Tricycle merges the Big Wheel style with thinner construction similar to a traditional tricycle. The ride-on toy sits low and has a large rubber wheel in its front. Suitable for children two to five years, according to the manufacturer, but people who bought the item suggest it is more appropriate for children at least four years of age. Different models of the Hot Wheels Big Wheel have unique features that make them stand out. Among the items offered, as well as those no longer offered, the Hot Wheels Lights and Sounds Trike appears to be the most appealing. Ironically, this model is the least like the original Big Wheel of the lot.